Spot silver followed gold lower yesterday having initially targeted $19.50 the industrial metal pulled back to close the session marginally below $19 per ounce. The low of the session failed to trouble the 9 day moving average suggesting that the bullish momentum remains firmly in place, as for gold, and indeed this has been further confirmed in early silver trading so far with the commodity finding support from the 9 day moving average and pushing higher once again to test the $19 per ounce region. 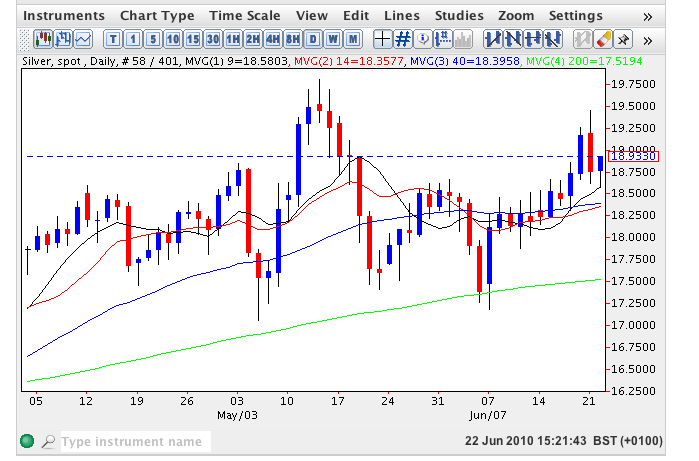 Provided the support continues from the short term moving averages then we should see $19.50 and above by the end of the week with a possible run towards $20 per ounce in the short to medium term.